Rep. Colleen Garry, a Democrat from Dracut, proposed making it a felony to block highways. She told the Lowell Sun she was furious about the Thursday morning protests that blocked two sections of the heavily traveled highway through Boston, one north of the city and one south. Nearly 30 protesters were arrested and arraigned on charges including trespassing, disorderly conduct, resisting arrest and willfully obstructing an emergency vehicle. State police said an ambulance transporting a seriously injured car crash victim to a Boston hospital was forced to divert to a hospital outside the city that did not have a trauma unit. The man survived. State Sen. Richard Ross, a Wrentham Republican, filed legislation that would impose a minimum $5,000 fine and allow a jail sentence of up to six months for willfully trespassing on state highways. Current law allows for a maximum $50 fine and a jail term of no more than three months. 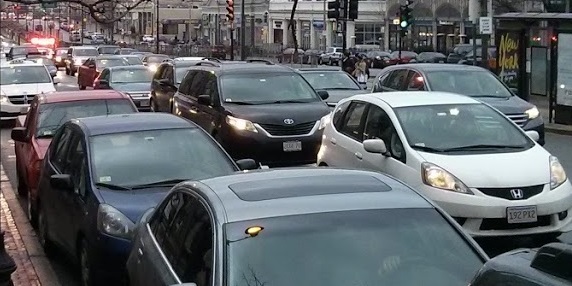 As part of its filing, the state will also propose letting all drivers use the high-occupancy vehicle lanes outside of South Station and the South End. These two pieces of news are, in fact, related: because together they illustrate the hypocrisy and insincerity of our Commonwealth's transportation policy with regard to emergency vehicles. If our elected officials truly cared about emergency vehicle response time -- which they should -- then they would put a quick end to this proposal that will destroy the efficacy of both the South Boston Bypass Road as well as the HOV lanes outside of the South End. If not, then it is quite clear that these politicians, Rick Ross and Colleen Garry, are merely posturing and mouthing platitudes, all while silently sticking it to emergency responders. By far the most common obstacle for emergency vehicles on our roads is not protesters: on a daily basis, emergency vehicles are obstructed by other motorists and the traffic jams created by motor vehicles. First, a little background: it is quite common for ordinary motorists to believe that the exact same facilities that enable their own travel at high speeds are also beneficial to emergency vehicles. A related objection to certain traffic-calming measures is that they will slow emergency response. However, in reality, the truth is much more complex and requires context-specific analysis. More car capacity might help emergency vehicle response time, under some circumstances. In other scenarios, additional car capacity might harm emergency vehicle response time. An additional, open, free-flowing lane can help emergency vehicles -- but if that same lane jams up with private automobiles then that lane just becomes an obstacle: an overall detriment to response times. In that scenario, removal of a jammed travel lane -- a reduction in car capacity -- can give emergency vehicles the maneuvering room they need in order to avoid the obstacle created by other motorists. The BU Bridge renovation project gives a prime example of how removal of a lane can help emergency vehicles. The engineers behind this project understood that the prior existing condition of having four substandard travel lanes (with no shoulders) was unsafe and liable to create immovable jams at a crucial choke-point for emergency vehicles traveling between Boston and Cambridge. Therefore, they chose to eliminate a lane and reallocated its space into a pair of 5-foot shoulders on either side of the motorway. These shoulders are not intended for motor vehicle travel but they do provide a space for other vehicles to pull over while yielding to an emergency vehicle. In addition, they provide breakdown space to help recover from crashes or other incidents. They also serve as a continuation of the bike lanes coming from Boston. All-in-all, a fairly solid engineering compromise, considering that the intersections on both sides of the river need substantial renovation and rethinking. "There's going to be road rage," predicted Stanley Spiegel, who lives across the bridge in Brookline. "If you're going to spend public money to go for an improvement, you don't predictably make things worse. This kind of attitude shows zero concern for the safety of anyone else, but it is sadly all too common among entitled motorists of Mr. Spiegel's ilk. Whenever safety or emergency response goals conflict with increased car capacity, we can see quite clearly where motorists like him stand. Thankfully, in the case of the BU Bridge thus far, MassDOT has not capitulated to the bullies who would remove the shoulder space and turn it back into a fourth congested travel lane. The South Boston Bypass Road was assembled out of a narrow right-of-way for the purpose of helping the industries along the waterfront thrive during the Big Dig. It also keeps a bunch of heavy trucks off of the regular city streets, and it provides a clear lane of travel for emergency vehicles operating between the South Boston Waterfront and South Bay. As you can see from this picture, the shoulders are fairly small: they seem to vary from 2-4 feet. It's not a road designed for high volumes of traveling vehicles. As a result, heavy traffic induced on this road could result in jam-ups that would be impassable for emergency vehicles. For a number of years, pundits such as Shirley Leung have been campaigning to allow private cars on it. She has quoted old-school 'highwaymen', such as Frank DePaola (who coincidentally is the interim Secretary of Transportation right now), with statements like this: "If you have traffic, and you want to relieve it, you have to find road capacity." 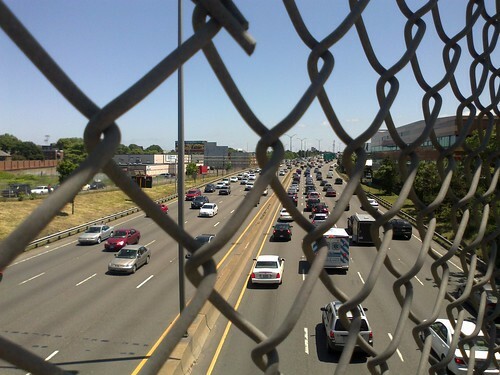 As a result of this kind of short-sighted thinking, the South Boston Bypass Road will be jammed up with private cars and will not be able to serve its former purposes any longer. And it goes to show, that when the political push comes to shove, concerns about emergency vehicles suddenly disappear, in favor of a temporary band-aid covering up much deeper, systemic problems with South Boston transportation. HOV lanes are also a popular target of attack by privileged motorists. It's so common that it's even got a name: the "Empty Lanes Attack", so called because drivers will often claim that the HOV lanes are "mostly empty" or not being used, and therefore should be given over to single-occupancy vehicles. What they (intentionally) fail to realize is that the relative emptiness is what gives the HOV lane its value: it is passable. If it were congested, then it would not be useful. Too bad, then, that even our Boston MPO doesn't seem to understand that most basic of concepts. And because such lanes are designed not to be congested, they are also useful for emergency vehicles that need to bypass major traffic congestion. Thus, the proposal to 'open' the HOV lanes outside of South Station to general traffic will result in degradation of emergency response times. Where is the outrage? Why, of course there is none: because motorists only pretend to care about ambulances when doing so happens to be convenient. The "Empty Lanes Attack" trumps their false concern about emergency vehicles: the allure of additional single-occupancy vehicle road capacity takes precedence over safety principles. If officials really cared about emergency response times, then I-93 would have full-width shoulders and/or HOV facilities/zipper lanes extended all the way from end-to-end: taking existing lane space where necessary. It's the only responsible way. But, in fact, the current configuration of the highway that excludes such safety features from much of its length, especially where most constrained. This shows where the true priorities lie: always pushing for 8 lanes of general travel no matter what the consequences are to emergency vehicles or highway safety. Convenience for drivers of single-occupancy vehicles is more important than safety, to our decision-makers. The fact is that it's easy for officials to claim that they care about emergency vehicle response times when doing so also means more capacity for drivers. But real courage would be shown by officials who show that they care about emergency response even when it's not politically convenient to do so. That means support for restricted lanes such as HOV or bus lanes. That means supporting safety features within the existing right-of-way of roads, without requiring costly expansion. And that means not playing these insincere political games in which 'concern' for safety only arises when it is useful for pursuing another agenda; when that same 'concern' suddenly vanishes the moment it is no longer useful. I would guess that most drivers do not think about emergency vehicles at all; I suspect that when they encounter one, they yield or don't yield, but do not actually think about how emergency vehicles are accommodated on the roads or how best to accommodate them. On the Atlantic Citylab, in his post "The Invention of America's 'Love Affair' With the Automobile" (http://www.citylab.com/commute/2015/01/the-invention-of-americas-love-affair-with-the-automobile/384944/), Eric Jaffe quotes Peter Norton: "Drivers accept that streets are for cars and don't have much to say about it—until another street user behaves as if streets are for anything else." I found your post illuminating. I currently live in Virginia but used to be a walking Bostonian myself.